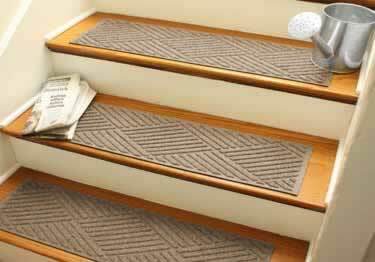 Decorative and functional stair mats look great while protecting stairs and providing excellent slip resistance. The fiber face of these stair mats is made from premium-grade 24-oz, anti-static polypropylene. The commercial-grade rubber backing is made with 25% recycled rubber. These mats are resistant to mold and mildew and will not fade even in intense sunlight. Great for indoor or outdoor use! Built to last, the molded design of these stair mats will not crush or breakdown over time or use. Available in 7 decorative patterns and 18 colors. Certified slip resistant by the National Floor Safety Institute. Mat size: 8.5" x 30"
Considering this product for wooden staircase down to basement. What is recommendation for installing on painted wood steps. Nail down or adhesive? I'm looking for slip-resistant tread covers for glass steps. I have 14 steps and 2 platforms. Most steps will fit with the size of this product but some are smaller and the platforms, of course, are larger. My questions are: 1. Where on the web site can I see what the varied patterns look like? I only find color options. 2. Can these covers be cut to fit, or are there other available sizes to accomodate smaller steps and larger platforms? 3. I assume there is some sort of adhesive on the back? Will it adhere well to glass? Will it be difficult to remove the glue should I want to later remove the covers? Thank you. Decorative and functional stair mats look great while protecting stairs and providing excellent slip resistance. The fiber face of these stair mats is made from premium-grade 24-oz, anti-static polypropylene. The commercial-grade rubber backing is made with 25% recycled rubber. We love these stair mats. I have put them on lament covered steps so my elder dog can go up and down them with ease. They do not slip and are working great. Maxie out dog is not scared to go up and down the stairs now. Thank you for your review. We very much appreciate your feedback and we're happy to know the Tread Covers are working great, and providing good assistance to your elder dog. No-Slip Hinged & Non-hinged stair provide great anti-slip protection. Available in 3 different color/patterns and 24 sizes. Slipping is gone with Carpet Star No Slip Nosing. Available in 21 standard lengths & 23 colors to match your carpet.